The city, which was founded 410 years ago, provides stark contrasts as young students walk past centuries-old architecture. 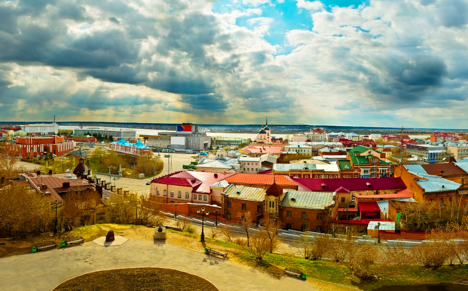 Tomsk also has one of Siberia’s youngest populations. Six major universities, including the Tomsk State University and the Tomsk Polytechnic University are located here, and twenty percent of the city’s residents are students. The streets of Tomsk contain some of Siberia’s oldest buildings, and the contrast between the faded architecture and the youthful students creates a powerful juxtaposition between the past and present. Daily nonstop flights connect Moscow and Tomsk ($300 roundtrip). A separate rail line links Tomsk with the Trans-Siberian Railroad. From the east, trains leave Novosibirsk for Tomsk on odd days (6 hours, $20-140). In the Altai Republic to the west, trains also depart from Barnaul for Tomsk on odd days (12 hours, $25-70).